A Boys Overstuffed Tote Discounts Apply ! 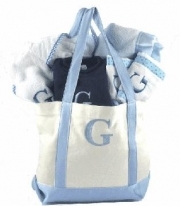 100% cotton Canvas Tote Bag -18-1/2" x 13-1/2" x 5-1/2"
2 Thick Diaper Burp Cloths with beautiful ribbon adorning the edges. An Adorable Roll Neck Baby Sweater. 100% cotton. Sized 0-12 months. A luxurious 16 oz. Terry Cotton Baby Bathrobe with gingham trim. All this plus a super soft 30" x 40" fluffy, satin trimmed blanket sure to be baby's favorite bankie to snuggle with. Please allow an additional 3-4 days for personalization. *This item will ship via UPS standard ground shipping and may ship separately from other items in your order. Please contact us for other delivery options if you need it sooner.